Hi, good morning from a rainy Romania. Occasional wet days are a great excuse to stay in and write blog posts so I want to explain today why we opted out of school and why we opted out of normal, or rather why we didn’t. It’s something that’s been on my mind since Jessica wrote this fabulous posts about grandparents and their support, or negativity towards, alternative lifestyles. It’s mostly about travel, but translates well into homeschooling, unschooling or worldschooling families. There are assumptions about reasons to homeschool, many of those assumed reasons don’t apply to most of us in the alternative education world. That and, well, I’ve had a few issues of that nature this morning. My own family aren’t involved in our life these days because of repeat problems of disapproval and hostility. That’s sad but also for the best, a great weight of guilt and stress has been lifted from my shoulders. 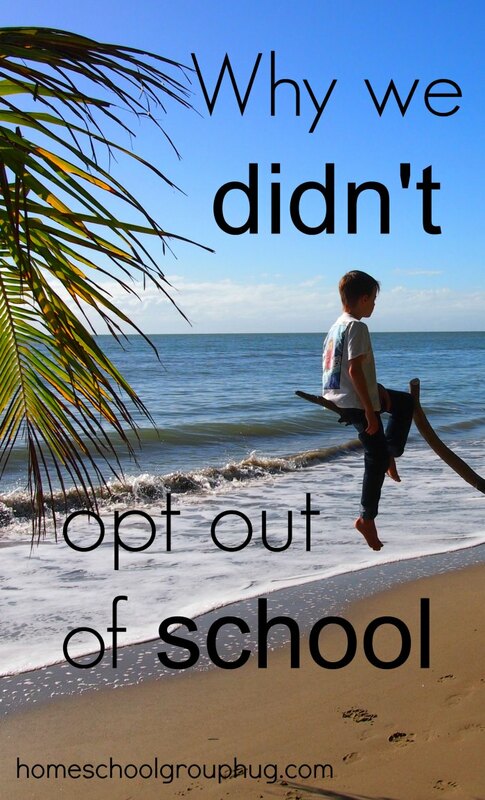 So because some people just still don’t or can’t get it, lets talk about why we didn’t opt out of school in the first place. Help us by saving this image to Pinterest, just hover and click. We didn’t initially pull my elder child out of school after 2 years to stick two fingers up at the world. We didn’t decide not to send my younger child to school to cause maximum annoyance or because we think we’re better than everybody else. We didn’t sit down one night and talk, for hours, developing this grand plan to travel the world with the kids to broaden their minds and education to piss off anyone who’s life choices are, or were, different to ours. We made these choices because we believe, deeply, that they are the best ones for our children and our family. Bizarrely, we never thought anyone would be annoyed by our choices, but they seem to be. Sometimes you just can’t fathom people. I’m not a hippie! Homeschooling families come from every class, background and walk of life. Some are doctors, some are teachers, some are travel bloggers. We live in cities, in remote regions and on paradise isles, we are just like you. If you’d like hard data on homeschooling demographics, the information, graphs and percentages are in this article. Once upon a time, I had a job that paid very nicely thank you. I quit and we got by on my husband’s ( then) much lower salary because the new baby I was holding was far more important than money or career. That’s the way it was and always will be. The kids come first, I, or we, will do ANYTHING, to make their childhoods as happy, enriching, fun, healthy, safe and magical as we possibly can and that, to me, means spending the maximum amount of time with them. When I started blogging it was just a hobby. Now it pays the bills and I guess we’re a little “famous” in our particular small pond. Blogging is enjoyable, we’re always learning more and, to be honest, I like the idea of having the blogs to hand on to the kids. A ready-made passive income will be a great help to them in whatever life path they choose. I’m not into self-promotion or becoming a media celebrity, that’s not me. We didn’t just decide to quit school because I couldn’t be bothered to wash school uniforms, pack lunches, help with homework or take part in the God-forsaken, Hell-on-Earth school run every day. We’re glad to be out of that circus, sure, but that wasn’t part of the choice. Homeschooling is not an easier option, it’s a huge responsibility and a lot of planning, thinking, research and every-day effort goes into a home education lifestyle. That and having the kids with you 24/7 has it’s moments. Trust me, this isn’t the easy way. We care deeply about education. I think this was possibly the number one driving force in our decision making. We saw what was going on in the school and found it unacceptable. We wanted more and we still want more. Well, OK, I am a bit. I’m an introvert and like my own space but we adore getting out into the world and mingling with people of every sort. We wanted that for the kids too. We didn’t think that restricting their socialisation to one classroom of same-aged kids or the population of one small town that really didn’t have a whole lot of diversity going on was the best plan ever. We wanted them to see multiple sides to everything and to understand that there are millions of ways of living, all normal, all right. For that we have to get out and about a bit and let them mingle with everyone, from Princes ( yes, we met one), to paupers. It is hard to find them other kids to play with on the road, but they only need that sort of interaction from time to time. School-users assume kids need to be kept in herds to thrive, it’s not true. Their best friends can be any age, gender or race. From time to time we hook up global play dates, we will actually get on planes to do this, or take them to favourite playgrounds that we know are always fun and full of kids. Most home schoolers have a fixed base and the sort of active and extended homeschooling networks we enjoyed in London or Queensland. We’re a bit different, we’ve been travelling for 3 years. I have no problem with somebody else’s choice to send their kids to school. Really, I don’t. I actually don’t care. I’m not judging you. I do have a problem with the school system, I think it’s broken and needs fixing, but your choice, your kids. I have never and will never attack you for it. I will tell you how great homeschooling is if you wander onto my websites, but if I meet you on the street the subject will never come up. I dislike talking about school so I won’t even mention it. I do dislike quite a few teachers and their shockingly bad teaching, hygiene, attitude, education, safety standards and methods of handling children. It’s wrong, it’s bad. I don’t trust them with my children. I also know and love some wonderful teachers. I’m sure you went to school too and know exactly what I mean. I hate that my very young son, even briefly, was around these people. The stories he told me of things that happened in school ( and the things I saw with my own eyes) give me chills, still. 8 years later I’m still horrified and hate myself for ever sending him. Well, maybe we did, but our religious-nuttery involves giving them a deep understanding of and respect for all religions, not just the one the government would like us to know about. We’re anti-prejudice and the best way to pass that on to the kids is through giving them real life experiences far more valid than any of the trash in the media. I went to a great school and thrived academically. I was bullied, mildly, but I think most kids are and it’s kinda normal in our society, I don’t think it’s something that will go away without vast social changes. I certainly don’t carry any lasting scars from school bullying. I had good teachers and bad teachers, one terrified me. That same teacher massively traumatised some kids. Some of my teachers are still friends today. I didn’t want my son to be youngest in his year, which he was, that made my school life much harder than it needed to be. My husband was, shall we say, less academic, so he was more anti-school than I. He still maintains that he learned more through scouts than he ever did in school and that his scout leader, who sadly passed away recently, was the biggest influence on him growing up. So no, I didn’t hate school at all. That’s not why we homeschool. We homeschool, worldschool or unschool. We enjoy it and it’s working out just fine. The kids thrive on our unconventional lifestyle, they’re great learners, have diverse interests and a sufficiency of good friends all over the world. Who knows how their lives will turn out? That’s up to them. I won’t push them into exams, university or respectable jobs, they will make their own choices. Maybe they’ll want or need to do the exams, that’s fine, I don’t mind. We will support them in that just as we always have. What about you, what are your reasons to homeschool or reasons not to? This is wonderful! We have been experiencing some of the same negativity and rather hostile reactions at times recently for making the same choices, but you have put into words so much better than I could! Thank you! Thank you Nicola, very kind. It’s great that people are questioning tradition and doing what’s right for their families! We’ve chosen to “traditional-school” at the moment in order to have more family time. Yes, you heard that right, We have more time as a family this way. My kids are in school about 25 hours a week which gives me the freedom to work part time in a well paying job that I love. The financial boost this gives our family allows my husband to scale back his hours and be home with us every single evening and weekend of the year. We’re also able to take about 10 weeks completely off every year this way which we can spend together, 24/7. I like the idea of homeschooling, but having one parent with the kids while the other one works long hours doesn’t work for our family. We do plan to take the kids out of school for a year or so at some point, so I always enjoy reading about homeschooling, but it will only happen when we can all do it together. Good luck Deanne. Hope it all comes together for you soon.I must admit, being solo parent, as I am at the moment, is very hard work. I’m incredibly grateful that we live here in Romania and that the kids can safely go off without me, hang with good friends, help build houses, tend animals and gardens, that sort of thing. I get a break so that I can actually do some work! But when travelling, I’d rather be solo, it makes it easier then, the trip is more child focused and I haven’t got work, cooking, cleaning , laundry, garden, wood chopping, food shopping and education pulling me in 10 different directions, we can just relax and…breath. Love it! We don’t homeschool (in fact I’m a high school teacher), but I totally agree that parents need to choose the education option that is right for their family. I have a number of friends who were homeschooled and they are wonderful, happy and successful people. The amazing thing is, once you grow up, nobody seems to care which school you did or did not go to (at least in my neck of the woods). As a parent of children with special needs we have tried a number of different options and will continue to do so – homeschooling is definitely one of them. I really appreciate the work you do sharing your stories, experience and advice. Just found your blogs and been reading all of them. We also homeschool and since we moved back to the UK we’ve also had to put up with disapproval from family and questioned when are we going to settle down (we lived in South Africa for years and had to answer to no one ?) We only travelling in the winter at the moment till we can earn online and travel full time. Love the idea of your base in Romania (we also did up a house in UK and built 2 houses in South Africa ). Loving your blogs! thanks! !